Chris LaScola sent me the recipe for one of his money flies. He calls this one Chicken Head. 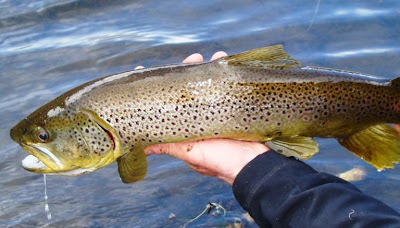 You can see from the photos that brown trout love chicken.....plus Chris is a catcher. 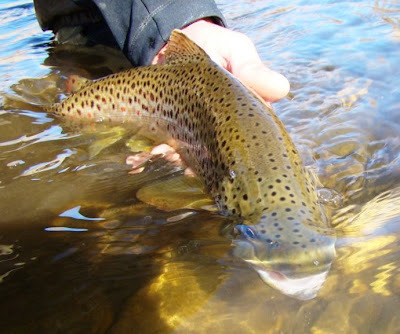 Chris wrote, "This fly has been very productive in our local waters. The combination of weight, color and the rabbit bring it to life. I hope it works for you as well as it has worked for me." Add a piece of white crosscut and wrap forward stopping a little short of the eyes. 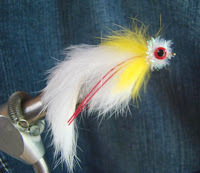 Add some red rubber to the fly and a piece of yellow crosscut. 1-2 wraps should do it. 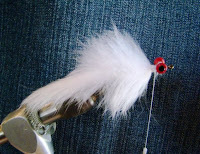 Then add a piece of crystal chenille and wrap around the eyes to finish the fly. Now add water and hold on.